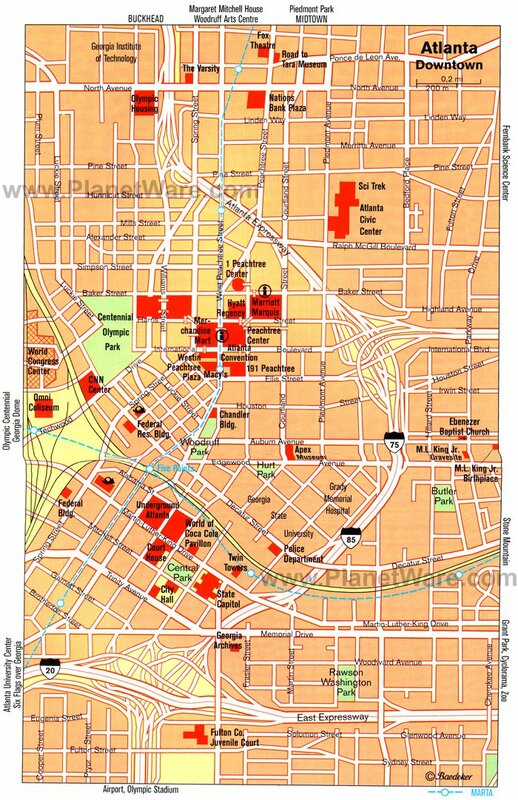 Atlanta, capital of Georgia, is in almost all respects the principal center of the American South. The city was originally a military outpost, becoming an early railway junction and rapidly developing into an important commercial town. During the Civil War, it was an important Confederate stronghold and supply base but was reduced to rubble when captured by Union General William Sherman. These events became the setting for Atlanta native Margaret Mitchell's best-selling novel Gone with the Wind, which won her the Pulitzer Prize. In recent years, Atlanta has become a major economic and cultural center and an important hub of air traffic. Internationally famed businesses, including Coca-Cola and CNN, have their headquarters here. Don't expect to find a romantic southern city, but rather a large and vibrant American city with southern charm and plenty of things to see and do. Its tourist attractions range from the arts to sports and include historic sites, museums, and gardens. One of the top things to do in Atlanta with kids, the Georgia Aquarium features a wide variety of marine life and some very interesting and interactive activities for visitors. The world's largest aquarium, it houses more than 100,000 aquatic creatures, including the largest in the ocean - whale sharks. You can see rare albino alligators and watch as trainers interact with California sea lions. One unique option offered by the Georgia Aquarium is the opportunity to dive or snorkel in the tank with the sharks. To participate in the dive program, visitors must have SCUBA diving certification. For those not looking to get wet, the aquarium also has an acrylic tunnel to walk through and view fish swimming on all sides. The Atlanta Botanical Garden offers a lovely space with a variety of well laid out gardens, including formal flower beds and majestic trees that frame the urban landscape of Midtown Atlanta. The Botanical Garden is a great place year-round, with something always in bloom. Spring is, of course, an amazing time with a riot of colors. Some of the highlights include the Orchid Display House in the Fuqua Orchid Center, the Winter Garden, the Japanese Garden, the Conservation Garden, and the Desert House. Two of its major specialties are the Rose Garden and the hydrangeas, each of which comprise the largest collections in the southeast. A special garden area is designed for children, and an elevated boardwalk gives visitors tree-top views down into the forest. What you will see there depends on the time of year you are visiting, although the indoor gardens are always beautiful at any time of year. Atlanta's place in the American Civil Rights Movement of the 1950s and 1960s is marked by a beautifully conceived interpretation center/museum that places this epic struggle into the greater worldwide movement for human rights. The Center for Civil and Human Rights explores the history of Jim Crow laws with actual television newscasts, speeches, photos, videos, personal accounts, and interactive experiences that bring visitors into the struggle. Portraits and stories of their work honor men and women who lost their lives in the struggle. The Human Rights Movement gallery carries the story into the broader picture of human rights worldwide: Apartheid in South Africa, women's rights, the rights of children and others, inspiring visitors to think about the rights of humans everywhere. Two blocks on Auburn Avenue are now protected as a National Historic Site. They include the birthplace of the civil rights campaigner Martin Luther King Jr. at 501 Auburn Avenue, which dates from 1895, and the Ebenezer Baptist Church at 407-413 Auburn Avenue, in which he and his father were ministers. Immediately adjoining, in the Freedom Hall Complex, is his grave. Between his birthplace and Ebenezer Baptist Church is Fire Station No. 6, which played a role in the life of the neighborhood and where volunteers tell stories of life here when King was growing up. The Martin Luther King Jr. Center for Nonviolent Social Change is also in this area. Performances at the Fox include diverse entertainment options such as operas, ballet, rock concerts, and movies, with hundreds of performances each year. In addition to the theater, there are two ballrooms: the Egyptian Ballroom and the Grand Salon. Both of these have been beautifully restored and are available for special events. Located just a short distance northeast of downtown Atlanta, Piedmont Park is the oldest and largest park in the Atlanta metro region. The grounds were the site of the Battle at Peachtree Creek during the Civil War. In addition to providing walking and running trails, the park has off-leash dog parks, gardens, sports fields, a lake with fishing piers, children's playgrounds, a swimming pool at the Piedmont Park Aquatic Center, and a splash pad for children at the Legacy Fountain. Local farmers and artisans gather on Saturdays at the Green Market, where you may find everything from fresh peaches, handmade soaps, and smoked meats to biscuits, Irish pancakes, sheep cheese, and sheep milk caramel. Look for chef demonstrations every Saturday from 11am until noon. On Saturday mornings April through November at 11am, you can learn about the park's history on a free guided walking tour, and on the first Saturday of every month, Piedmont Park Conservancy partners with the Atlanta Audubon Society for bird walks that explore the park's many different habitats. The park also hosts various events, from musical entertainment to fitness programs. The Atlanta History Center is a large complex that comprises the Atlanta History Museum, Centennial Olympic Games Museum, Swan House, Smith Family Farm, and the Kenan Research Center, along with a number of historic gardens. The History Museum features changing exhibitions and a permanent collection with topics such as the American Civil War, Folk Art of the South, and various other exhibits related to the history of Atlanta. The historic houses range in age from the 1860s to the 1920s and offer a glimpse of life during these time periods. The Margaret Mitchell House contains the apartment where Mitchell wrote Gone with the Wind. The guided tour includes a look at this room as well as a brief film and exhibition on Margaret Mitchell. The six historic gardens include both natural areas and formal gardens. The Frank A. Smith Rhododendron Garden is at its best in spring, when the rhododendrons and azaleas are in bloom. Visitors can also see an 1860s-style garden at the Tullie Smith Farm. The Historic Oakland Cemetery in Atlanta began as six acres in 1850. It was originally designed as a garden cemetery. Over the years, particularly during the time of the Civil War, the site grew, accommodating those killed on the battlefield. Eventually the cemetery came to encompass 88 acres. In 1884 the cemetery stopped selling plots. Eventually this once lovely cemetery fell into disrepair as those tending the plots moved away or died. In 1976 Oakland Cemetery was declared a National Historic Landmark and the Historic Oakland Foundation was established. In combination with the city the organization has done much work to maintain the cemetery. Today it is promoted as a historic cemetery and parkland with gardens, sculptures, and wildlife. There is even a Visitor Center and Museum Shop. Designed by architect Richard Meier and enlarged with three new buildings designed by Italian architect Renzo Piano, the High Museum of Art is noteworthy both for its architecture and its extraordinary collections of art from the Renaissance to the present day. It is particularly known for its works by 19th-century French masters and an extensive collection of 19th- and 20th-century American art. There is also a significant collection of European paintings and decorative art, and newer additions include modern and contemporary art, photography, and African art. The museum forms part of the Robert W. Woodruff Arts Center and hosts an annual film series featuring foreign, independent, and classic cinema. In 1886, a chemist named Dr John Pemberton devised a syrup designed to relieve headaches. A friend of his mixed the glutinous liquid with water and carbonic acid, and the result of the mixture soon became the world's most popular soft drink. The World of Coca-Cola illustrates the history and triumphal progress of the world-famous drink in entertaining ways that will please all ages. The Center for Puppetry Arts is a hands-on museum with a large collection of puppets from around the world. Some of the displays include Chinese hand puppets and African rod puppets. Other exhibits feature posters, videos, and photographs about puppetry. The Center offers a range of productions, from the Family Series performances to New Directions Series performances, which are designed for teen and adult audiences and focus on more sophisticated themes. Opened in 1992, the Fernbank Museum of Natural History portrays the nature and environment of Georgia, as well as technical and scientific phenomena with the aid of modern techniques. Some of the most eye-catching exhibits at the museum are the huge dinosaur statues at the entrance and the dinosaur skeletons in the Great Hall. Perhaps more entertaining are the interactive displays of the "Sensing Nature." There are many other interesting exhibits on the natural history of the local landscape and cultures from other parts of the world. Even the floors are attention-getting, made of limestone tiles with embedded fossils. A huge gallery is dedicated to temporary and traveling exhibits, and an IMAX theater shows nature-related films. The Michael C. Carlos Museum of Emory University has one of the largest collections of ancient art in the Southeast, with 17,000 artifacts from ancient Egypt, the Near East, Greece, Rome, Asia, Africa, and the pre-Columbian Americas. The ancient Egypt exhibits are particularly outstanding. In addition to these beautifully displayed and interpreted examples of pottery, gold work, and ancient art in all media, the museum also has exceptional collections of works on paper from the Renaissance to the present, opening a window into world cultures expressed through their art. One of the most popular places to visit near Atlanta is Stone Mountain Park, 16 miles east of the city center in DeKalb County. At its center is Stone Mountain, an 863-foot-high mass of exposed granite with a circumference of five miles. On the east flank of the hill is a relief of the three Confederate leaders, President Jefferson Davis and his two generals, Stonewall Jackson and Robert E. Lee, hewn from the rock between 1923 and 1970. But there is much more to do here than see this memorial to Confederate soldiers, who fell in the Civil War. You can climb to the top of the hill or ascend by cable car, and around it runs a 1940s locomotive on a five-mile circuit through the park. There are endurance courses of suspended rope walks and bridges through the treetops, a petting farm for small children, a land/lake tour on a 1940s Army DUKW that includes some local history, a restored antebellum plantation, and a museum with Native American artifacts and exhibits. Luxury Hotels: One of the top hotels in the city is the Ritz-Carlton. This is a five star property, with live jazz in the evenings, just a short stroll from the Georgia Aquarium. The Sheraton Atlanta has recently been renovated and features a beautiful outdoor pool and patio area. Just a bit north of downtown, in artsy Midtown, the Loews Atlanta, in a sleek glass tower, offers commanding views of the downtown buildings and outstanding dining options. Mid-Range Hotels: Across the street from the Ritz Carlton is the historic Ellis Hotel, with concept floors that include some exclusively for women and Fresh Air floors where the air is purified to be allergen free. The Residence Inn includes breakfast and features large suites with full kitchens, refrigerators, and a sitting area. Right near Olympic Centennial Park and across the street from the CNN Center is the Holiday Inn. All of these hotels are in convenient downtown locations. Budget Hotels: Budget hotels in the city center are difficult to find, and the best option is to stay a short distance outside the downtown area. La Quinta Inn, in Paces Ferry/Vinings, is a new property with decent prices, about 10 to 15 minutes by car from downtown. A little further away, in the Northlake area, the Hampton Inn features recently renovated rooms and an outdoor pool. The Red Roof Plus in trendy Buckhead, about 10 minutes by car from the city center, is another good option. There is also a MARTA rail station nearby with service to downtown. Save Time and Money: If you're planning a busy schedule of sightseeing, you can save time and money by purchasing an Atlanta CityPass in advance. This pass includes free entry into prime sites such as the Georgia Aquarium, the Inside CNN Studio Tour, and the World of Coca Cola. You can visit the attractions in any order, and the pass is valid for nine days from first use, giving you maximum flexibility to plan your itinerary. Best of all, you can skip the ticket lines, so you have more time to explore. 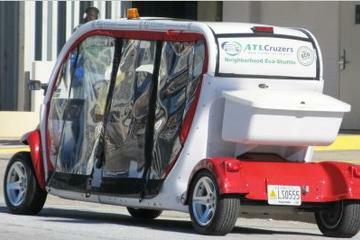 Sightseeing Tours: A fun and eco-friendly way to see Atlanta's top attractions without the hassle of finding your way around is the Atlanta City Tour by Electric Car. Let your driver and expert guide do the work on this 90-minute tour as you relax and take in the sights, including Atlanta's hippest neighborhoods, civil rights monuments, and Centennial Olympic Park. For a different look at the city, try the Atlanta Zombie Film Locations Tour. Fans of "Zombieland" and "The Walking Dead, will enjoy this three-hour tour, which visits related movie locations, complete with handpicked clips and insider secrets from actor guides on the air-conditioned coach. The tours include trivia prizes and a souvenir group photo, and you can choose from three different itineraries depending on your favorite characters and scenes. Visitors to Georgia will certainly not want to miss romantic Savannah, with its lovely parks and streets of antebellum homes. Not far north of Savanna is historic Charleston, in South Carolina, where you can also relax on the beautiful sands of Myrtle Beach. To the west of Atlanta and only about three hours by train, Birmingham is in the neighboring state of Alabama. South of Atlanta are the long sand beaches of Florida; the theme parks of Orlando; and Tampa, with all the beaches and water attractions of the Gulf Coast.